While building a house there is always a question what kind of roof to choose, what colour, should it be flat or pitched. When you live in a hot climate the answer is clear. A metal cool roof! A cool roof can reflect sunlight and cools itself by emitting the radiation to its surroundings. Isn’t that cool? The roof literally reduces the amount of heat. Two basic characteristics of the roof are solar reflectance and thermal emittance. It is like wearing a white t-shirt on a hot day, it reflects more sunlight and absorb the heat. Metal cool roofs might be one of the solutions for polluted cities. They have significant environmental benefits besides using cool roofs cool the cities. Increasing workplace productivity and decreasing pollution can be achieved by using metal cool roofs. Cool metal roofs actually last longer than standard ones because a cool roof doesn’t heat up that much. What’s more cool roofs are typically light in colors so they can perfectly be a part of the architecture for those who might consider it as an important feature. As today’s range of cool roofs is pretty wide and there are a lot of manufacturers, it can be a real challenge to make a good choice. Shanghai Metal Corporation besides other metal and steel products also offers a roof panel roll forming machine or a roof sheet making machine which are widely used for making various metal roof panels. For more details visit our website or send us inquiry. You could also follow us on Facebook, Twitter, LindkedIn or Instagram. If you have a smart phone or tablet you can download our new application by scanning QR code below. Our English speaking staff will be more than glad to help you. You can read more articles by this author here. California’s Mojave Desert. Occupying approximately 3,500 acres (14.2km2) and grounded on BrightSource’s solar tower technology, the thermal complex produces gross total of 392 MW of solar power. Over 300,000 garage-door-size mirrors are used to attract the power of the sun in two dimensions and reflect the sunlight to boilers that sit atop three 459 foot tall power towers. A center of earth location in relation to the sun is used so that each mirror in its solar generating system is precisely aligned. What is so special about Ivanpah Solar Thermal? Economic, social and environmental benefits are many. With the thermal’s construction 2,636 new local jobs were created, generating about $350 mi in local and state taxes. Clean, sustainable and reliable solar electricity serves 140,000 homes on average in California, while 400,000 metric tons of carbon dioxide emission per year is reduced, which equals to removing 72,000 vehicles off the road. Not only that, the construction of this iconic project was a breakthrough as it kept the majority of the natural landscape untouched unlike other mega constructions. When BrightSource’s 173,000 heliostat pylons were installed, grading and concrete foundations were limited to the maximum, allowing the vegetation to co-exist within the solar field below the mirrors. The project also accounted with an innovative and customized design; excavators operated in the 130-foot wide no-drive zones, traveling in the same tracks through the solar field and installing between 75 and 125 pylons per day, per machine. The innovative technology uses the same principal of electricity production i.e. high-temperature steam which turns a conventional turbine, where electricity is produced and transmitted to homes and businesses. The big difference is that at Ivanpah, the concentrated sunlight (and not fossil fuel) strikes the boiler’s pipes and heats the water to create superheated steam. Besides, the technology uses 95 percent less water than competing wet cooled solar thermal plants by employing a dry-cooling process, which uses air instead of water to condense steam. All water used by the steam production cycle is recycled back into the system, or consumed to clean the mirrors, highlights BrightSource. The Ivanpah Solar Thermal System is “critical to establishing America’s leadership in large-scale, clean-energy technology that will keep our economy globally competitive over the next several decades,” says Tom Doyle, president at NRG Solar. 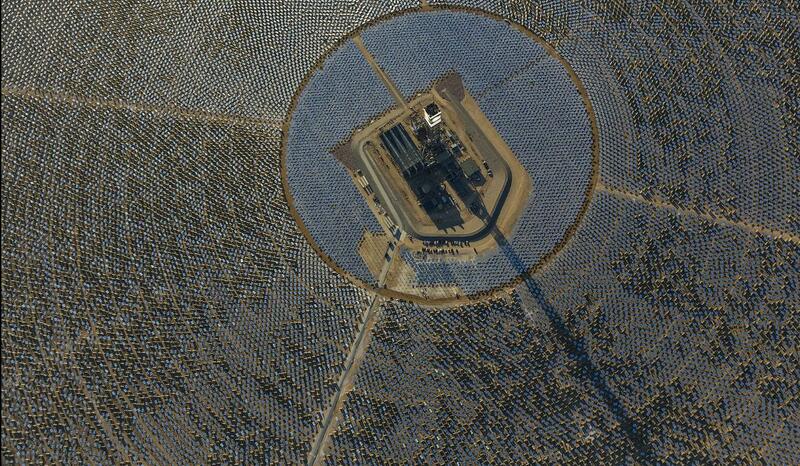 This is the future and the Ivanpah has, for sure, started changing the way we produce and consume energy. Shanghai Metal Corporation is proud to follow on news that represent massive step forward for renewable energy as previously reported here. SMC manufactures a wide range of Solar panel aluminum extrusion widely used in solar panels and tin coated/plated copper strip used in solar panel batteries. To find out more, please visit our Website or send your inquiry here. Our English speaking personnel will be more than pleased to help you. Follow us on LinkedIn, Twitter, Facebook, Instagram and don’t forget to subscribe to our YouTube channel. Or you could try our new mobile app by scanning our QR code.